At Queen's Park March 8 -- L to R: OPSEU's Deborah Gordon, Al Donaldson, and Warren (Smokey) Thomas with NDP Health Critic France Gelinas. Dalton McGuinty personally received more than 600 postcards in the legislature Tuesday signed by OPSEU members asking him to “walk the talk on mental health.” The stack of cards was walked across the legislature floor from the desk of NDP Leader Andrea Horwath. 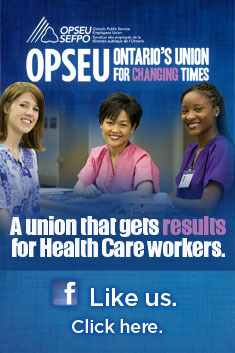 OPSEU had been at the legislature that day to bring the message that two and a half years of talk about improving mental health had coincided with two and a half years of actual cuts to mental health. In a press conference earlier that morning, OPSEU President Warren (Smokey) Thomas gave recent examples of a mental health system in decline. Twenty jobs were recently cut at the Regional Mental Health Centre in London and St. Thomas, and more are expected later this year. Children’s Mental Health Ontario expects they will lose capacity to serve 2,000 children across the province. They have only received two funding increases since 1992. NDP Health Critic France Gelinas expressed her disappointment in the government’s lack of response to the recommendations of the all-party select committee on mental health. Gelinas had been a part of the committee, which issued its report last August. Gordon said a 14-bed residential home for girls is closing in Sarnia is closing at the end of the month, and other residential facilities are just hanging on. OPSEU is asking that the government place a moratorium on any further cuts to mental health and restore funding to the Child Treatment Sector. Health Minister Deb Matthews has promised a 10-year plan for mental health will be introduced later this spring. 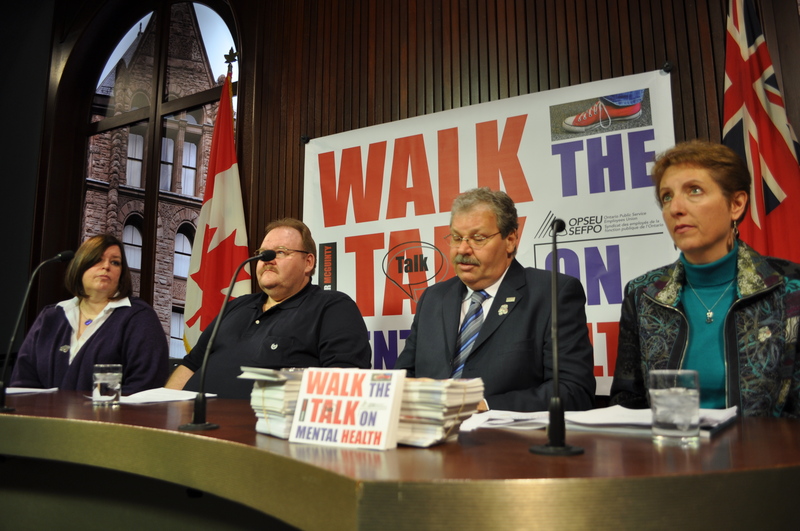 OPSEU has received more than 1,000 “walk the talk” postcards from members this week and will continue forwarding them on to the Premier’s office.